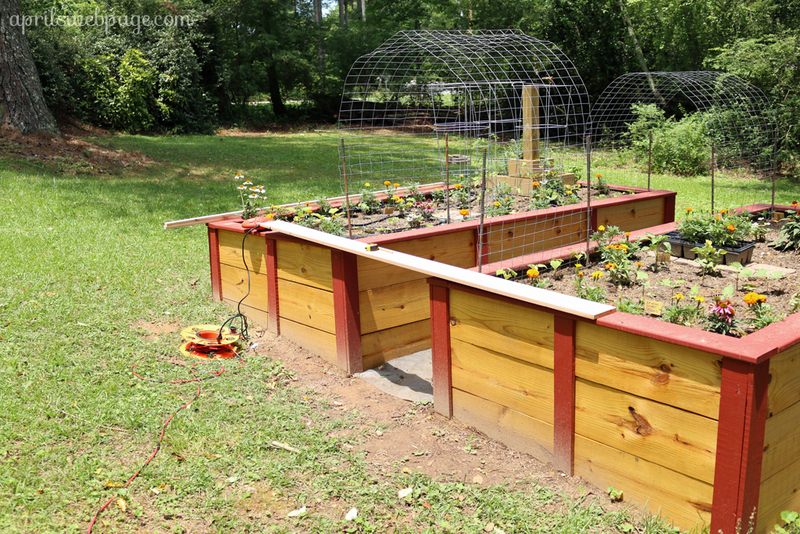 Since building the raised garden beds, I’ve had an itching to do something else on my own. 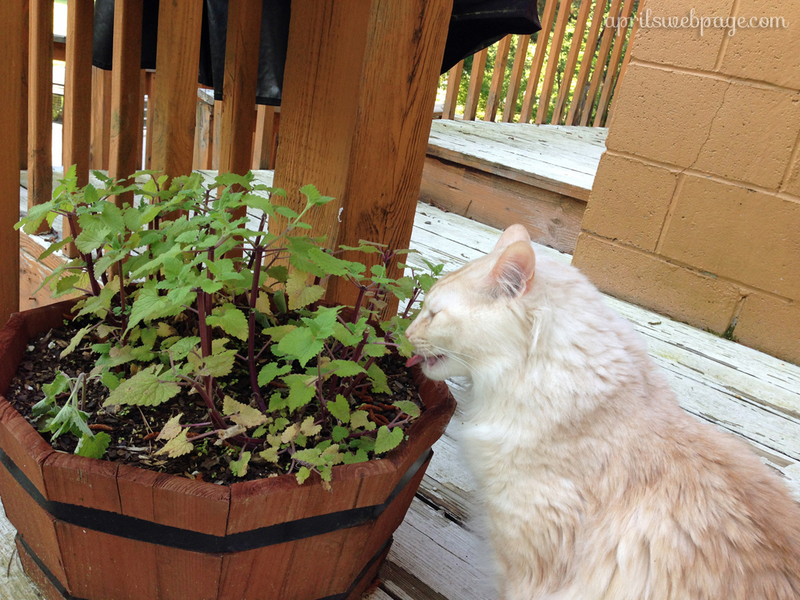 We’ve always had catnip out on the back deck so our cats could enjoy it while hanging out with us while we grill. Actually, I should say Oxford enjoys it outside while we’re grilling because he’s the only cat that can go outside and just chill. The others either get too exploitative, and we don’t want them to wonder off, or they think the world is coming to an end because they’re not safely in the house they know as their domain. This picture was taken last May when Oxford was keeping me company while I grilled. 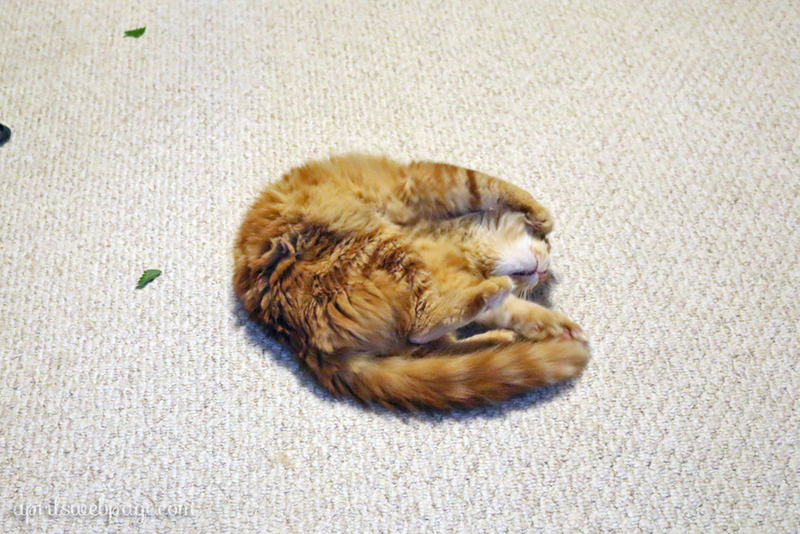 I’ve had that catnip plant for 3 years, but the cold weather in January and February of this year killed it. We had an instance in which a layer of ice froze on a lot of flowers and plants, and my guess is, that is what killed it. 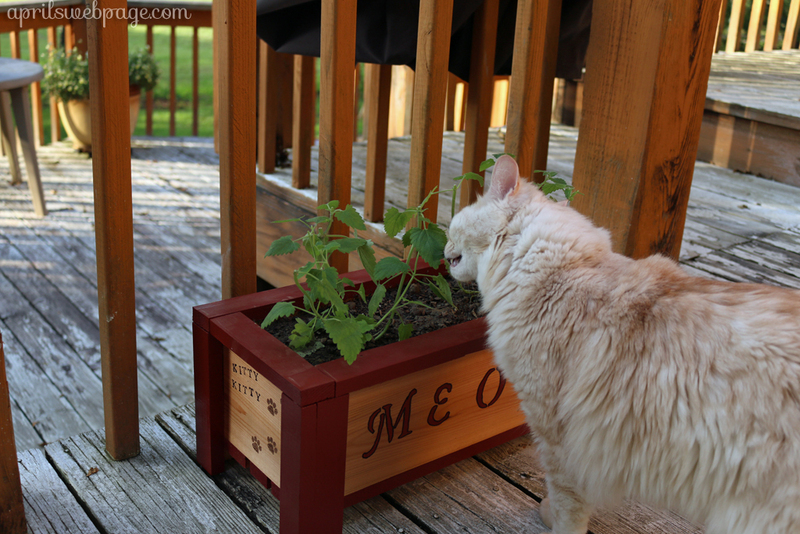 This year, since I’m getting a little more handy, I decided to build a new planter for the catnip. 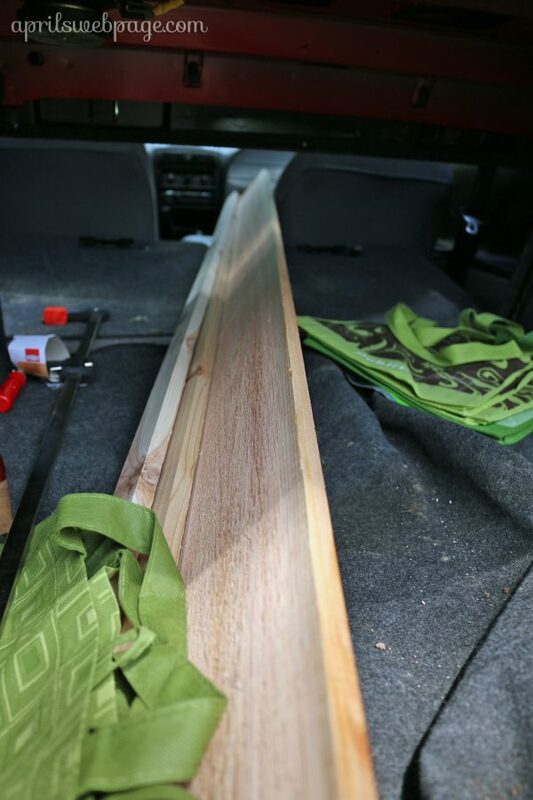 I purchased 3 cedar boards at Lowe’s for the project: 1 board at 1x6x8 and 2 boards at 1x2x8. Total cost for those 3 boards was $17.94. 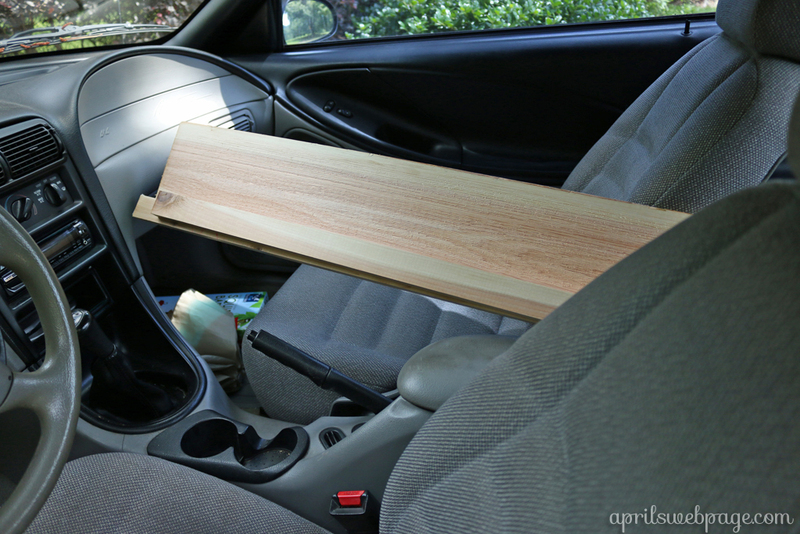 And those boards fit into my Mustang. Barely. Haha! I really need to fix me up a good working area for cutting wood. 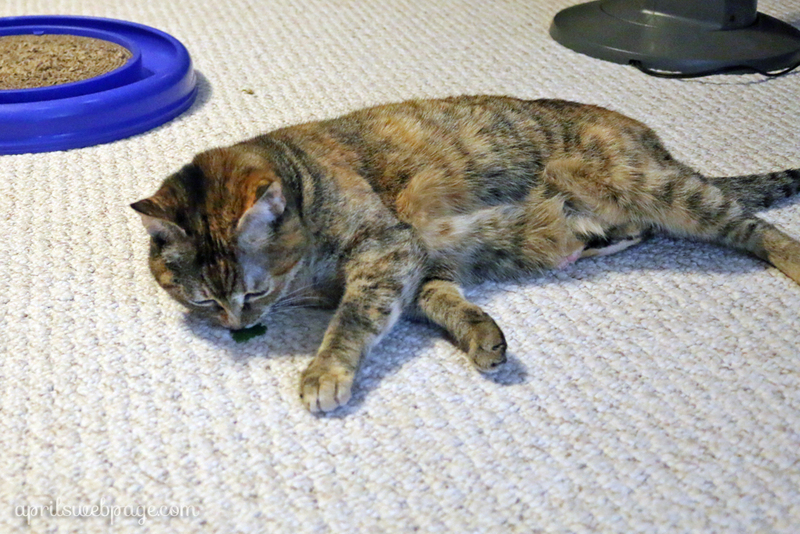 Right now, I am using the garden beds, which is not something I’d like to continue doing. I screwed up on my measurements a couple of times mainly because I had it in my head I was doing a 12″ side when I had decided to do 18″. 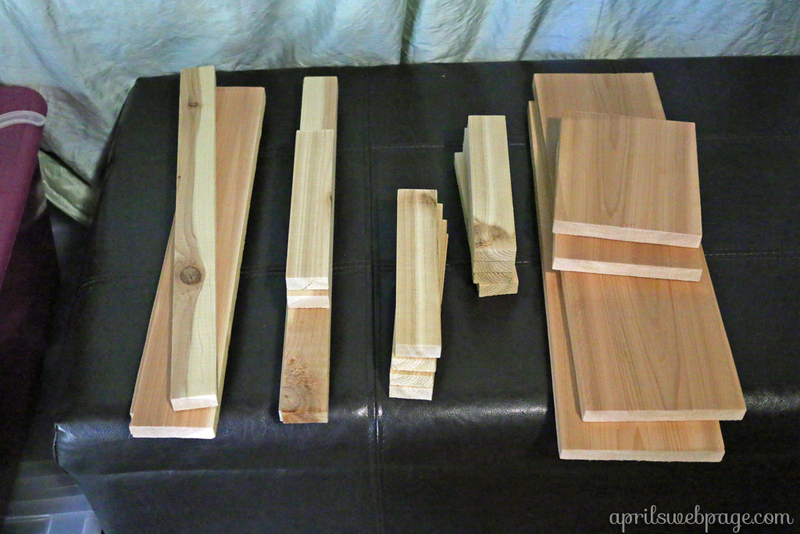 Thankfully, I still had plenty of cedar board to cut all of my pieces from, with a little left over. 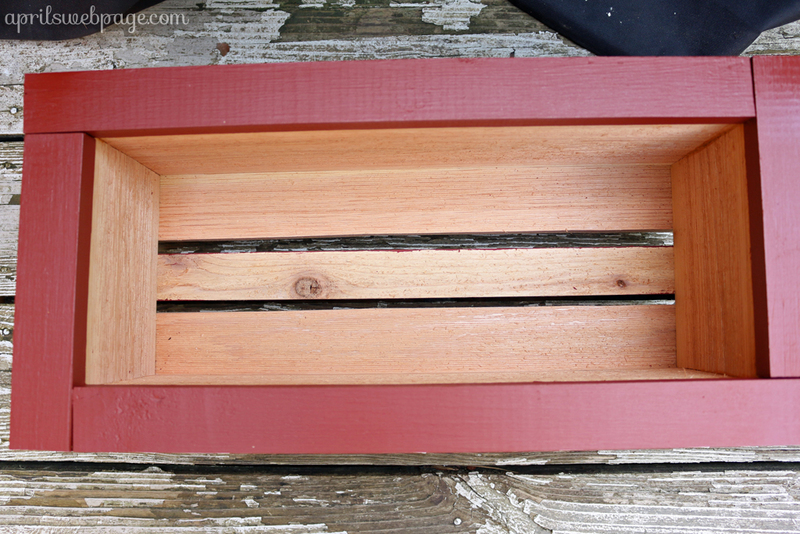 Then I stained the trim pieces with the same color I used for the raised garden bed trimming. I used the same color so I wouldn’t have to buy another stain for such a small amount of space to cover. 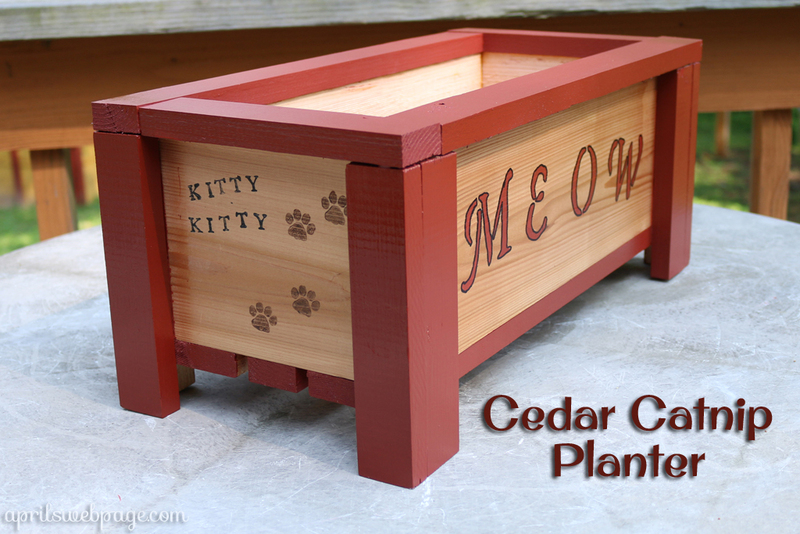 For this project, since it’s fairly small and cedar wood is easier to split, I used wood glue to piece together the planter’s sides, and then I used slender nails to further secure it. I purchased a cheap $6 clutch bar/clamp to apply pressure when gluing the sides. I will definitely get a couple more of these for future projects so I can speed up the process. Using the clamps made a lot of things easier while working alone! 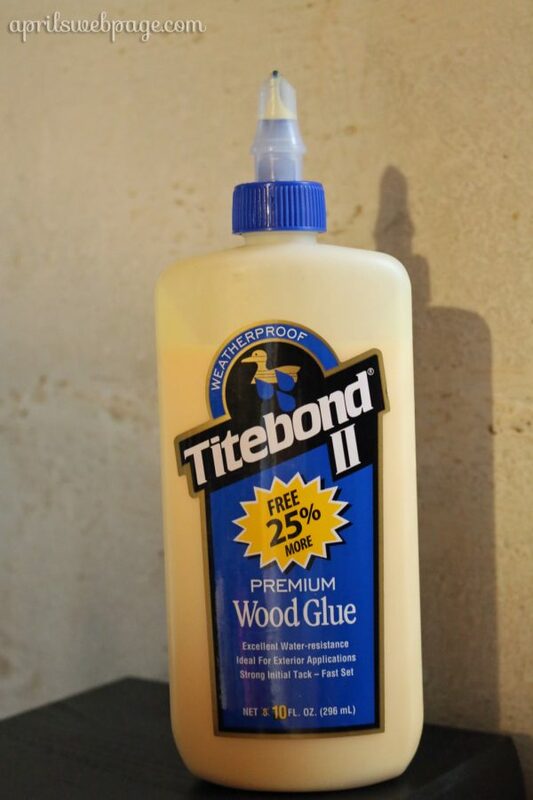 This is the wood glue I used. I LOVE it! In 20-30 minutes, it’s good to go. 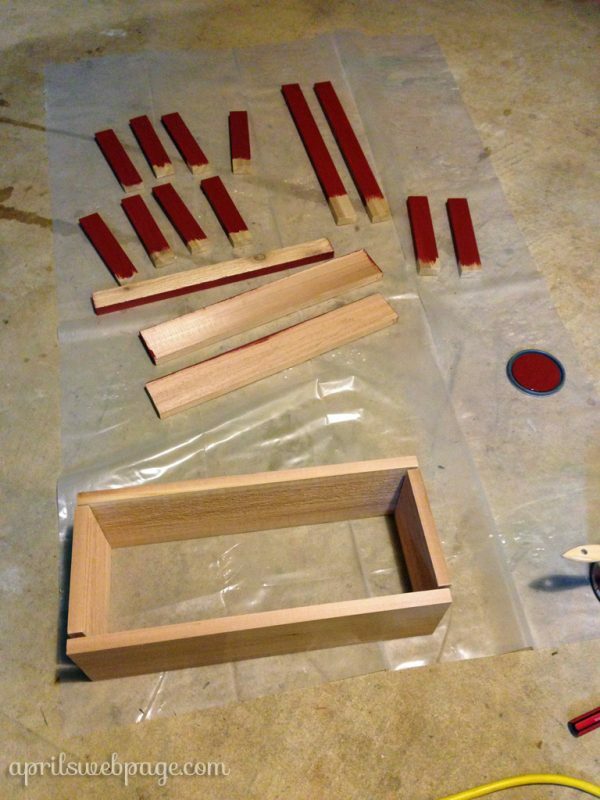 Once I had the box completely assembled, I attached the trim pieces with the wood glue as well. And then I decorated it especially for the cats. 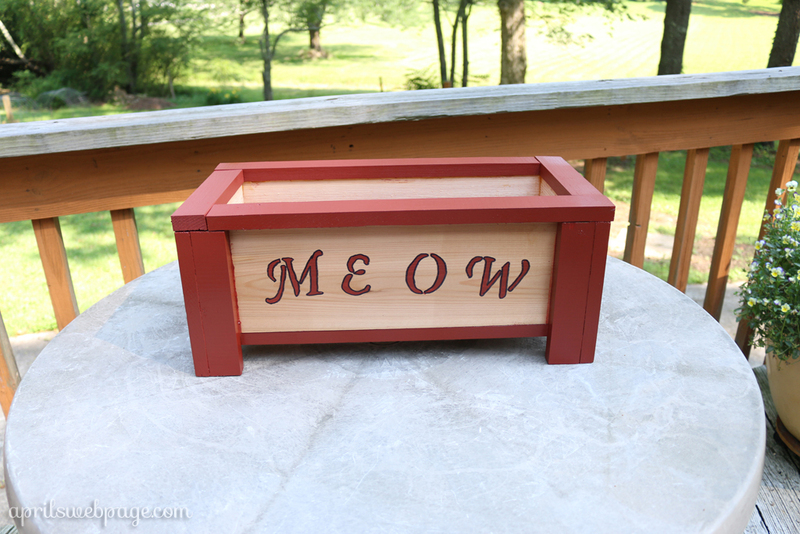 I used stencils to trace on the letters for the word “Meow” on the front of the planter. 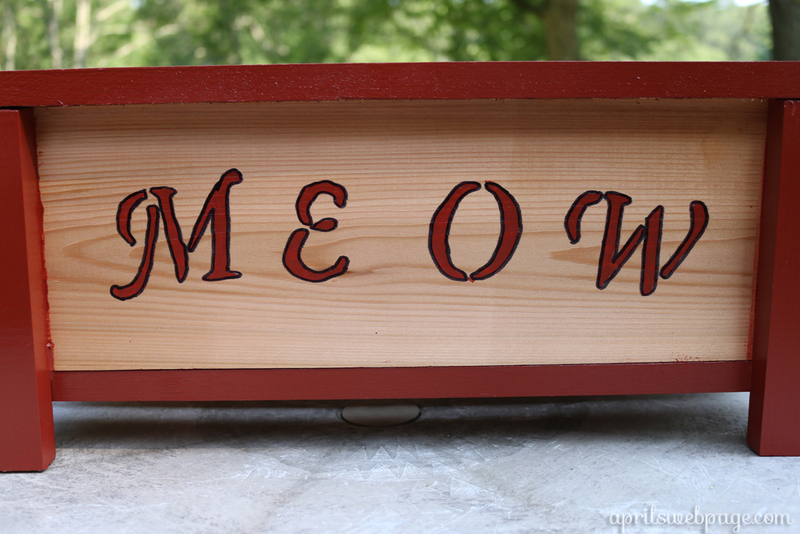 I used a small paint brush and the red stain to paint in the letters. Once that was dry, I outlined the letters with a black sharpie. 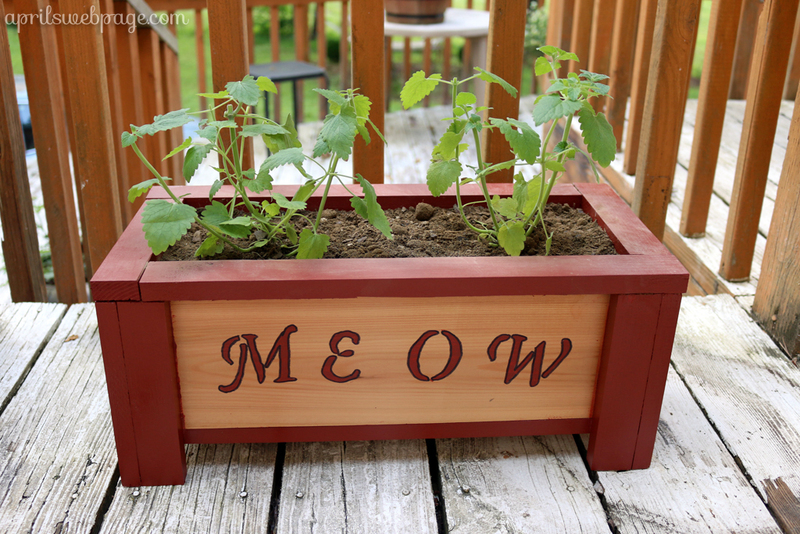 For the planter end that everyone will see when coming up the steps, I used rubber stamps and outdoor acrylic paint. 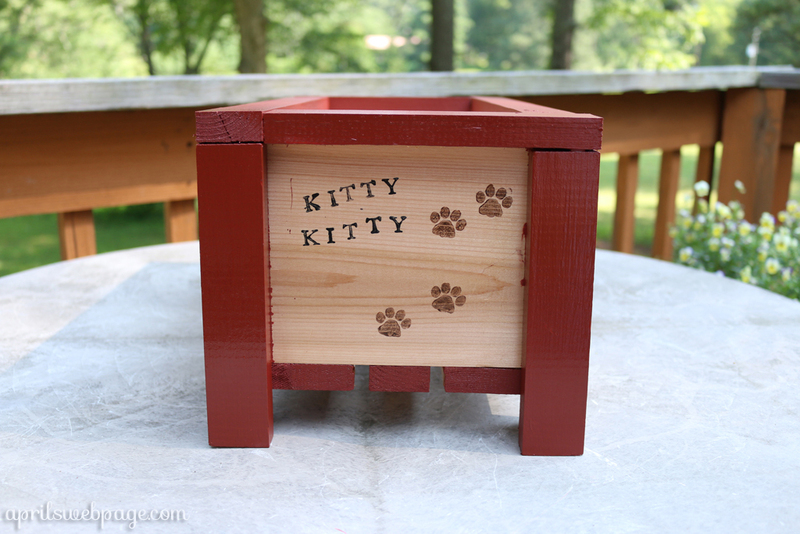 I got a little of the red stain on the cedar wood sides despite my best efforts. 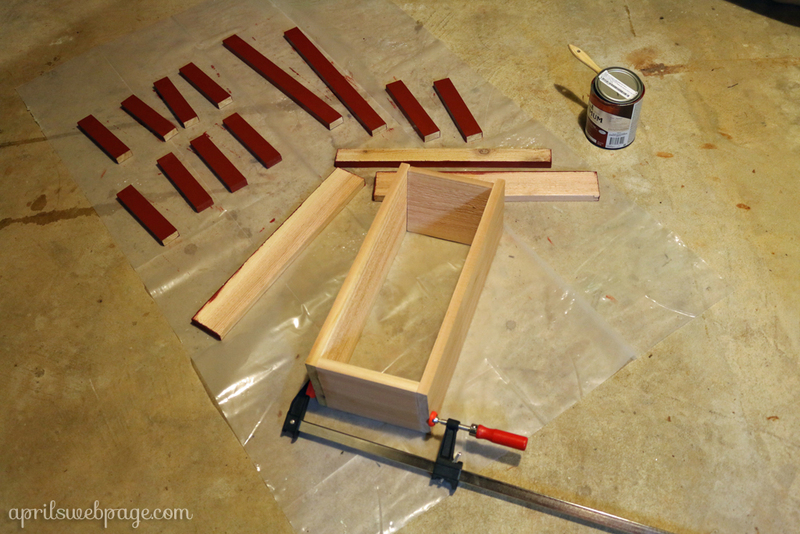 Once the paint was all dry, I used spar urethane to seal all 4 sides, using 3 coats of the sealant. 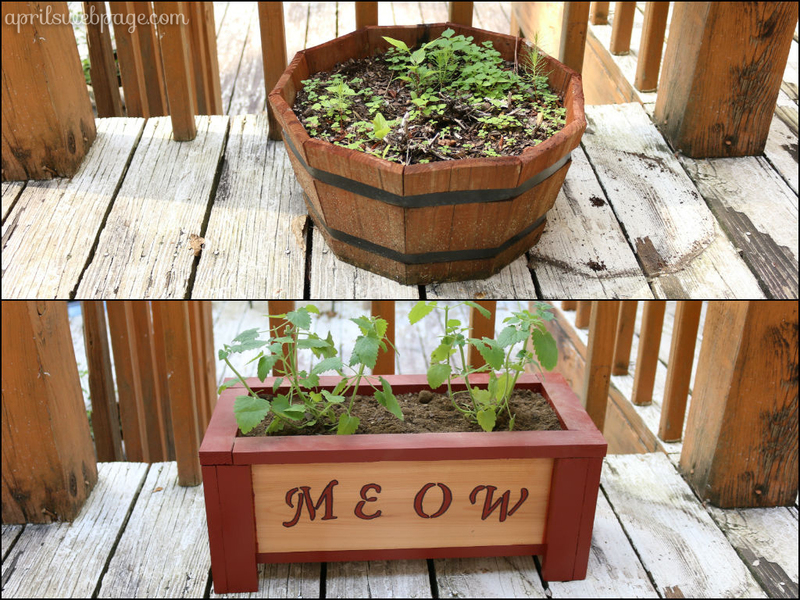 I had small gaps in the bottom of the planter because of the overall measurements of the planter (18″ x 8″). 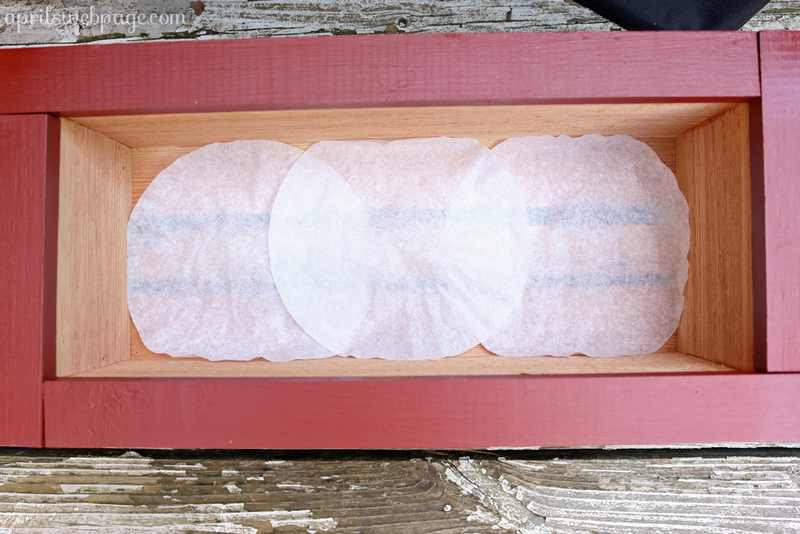 I just lined the bottom with coffee filters so the dirt (and roots) won’t go through the bottom. This planter looks much better in place of the old one. Ignore the weeds growing in the round one. And our terrible-looking deck. 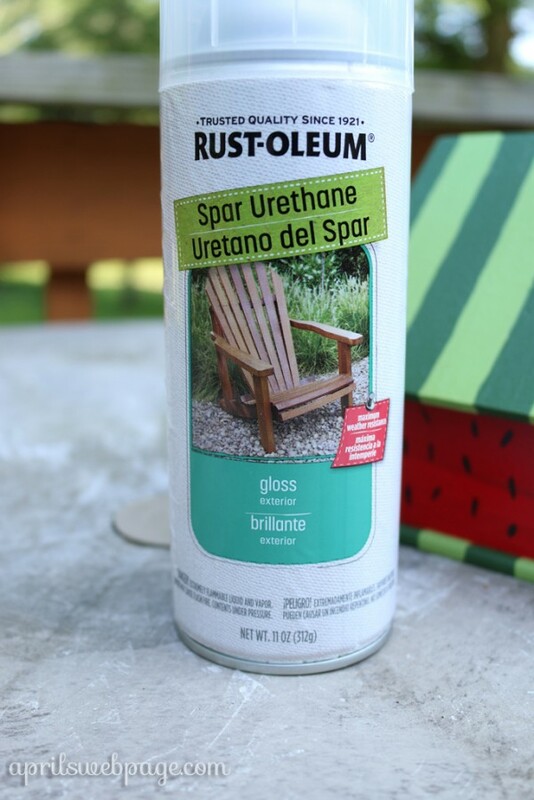 Refinishing the deck is a large project on my list much later down the road. 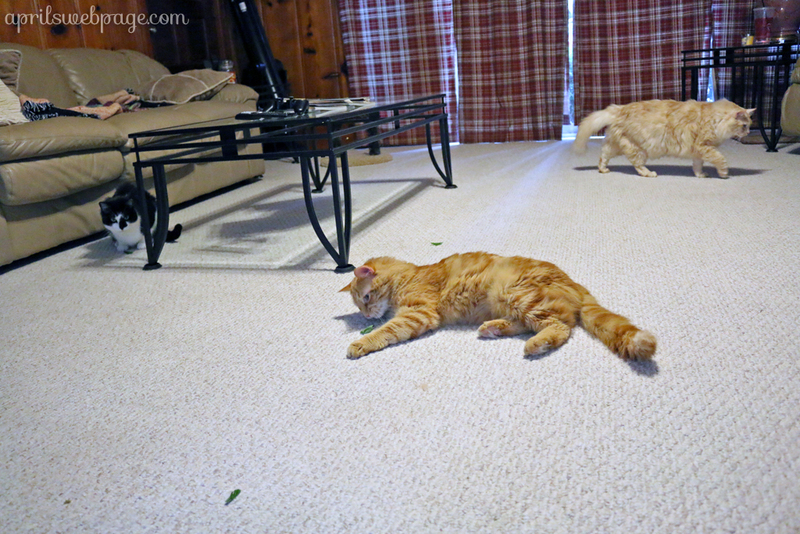 The other kitties will get to enjoy the catnip inside the house.